One of the advantages of participating in the Florida art show circuit for the past 35 years is the opportunity to personally display my work in front of thousands of people who can see my furniture first hand. Although many times that results in an immediate purchase, on occasion it leads to someone asking if I could custom create a special piece. I’m always willing to accommodate that request if I’m able. Sometimes I’ve had a customer ask me to make something that I’ve never considered. Such was the case when Nikki & I were doing the Under the Oaks Arts Festival in Vero Beach, Fl. 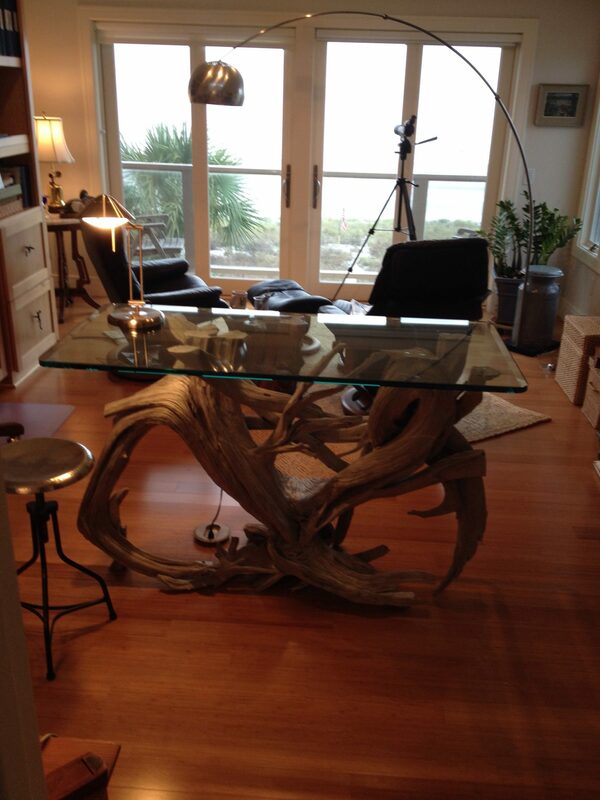 At one point during the weekend we had a couple on vacation from Hilton Head, SC ask me if I could create a driftwood standing desk. I was not familiar with the concept of a desk that was taller than the standard 30″ but I had already had a piece that I was planning to make that was going to be a very tall foyer table. 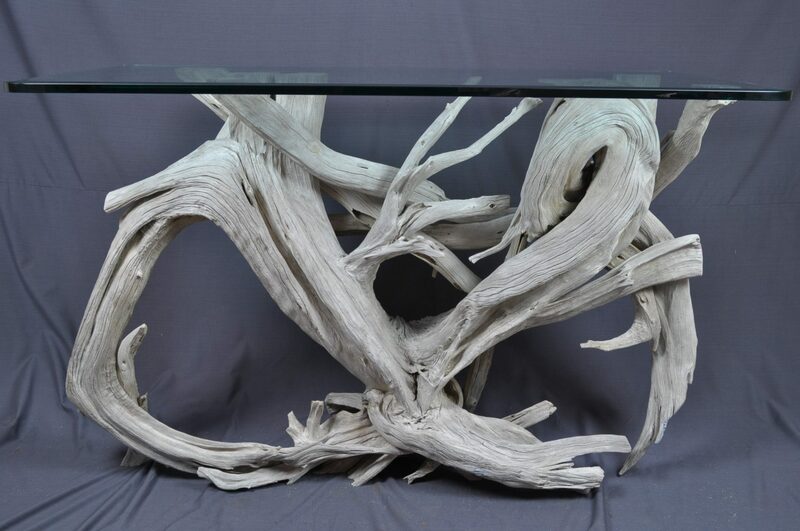 I wasn’t sure if I’d ever have a customer that would want a foyer/sofa table that was over 36″ high, but it was such an incredible driftwood stump that to trim it to a lower height was something I couldn’t bring myself to do. That is a gorgeous piece Don!! Wish I’d had a place for it! Thanks. I had that stump for some time & kept wanting to do something with it. Usually I would trim it down to 30-33″ & make a nice foyer table out of it. 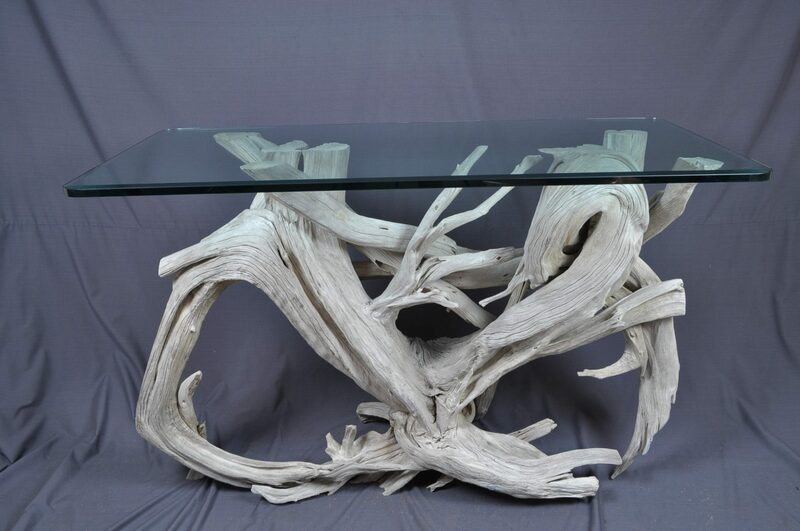 But as you can see, at the top it had that root that curled around which really made the whole piece stand out. Finally I just decided to create a very tall sofa/foyer table out of it & hope I’d eventually have a customer that it would appeal to. Lo & behold, it was the perfect table for my customer to use as a standing desk. He wanted patiently for it to finish weathering & now it is in the perfect setting overlooking the beach.